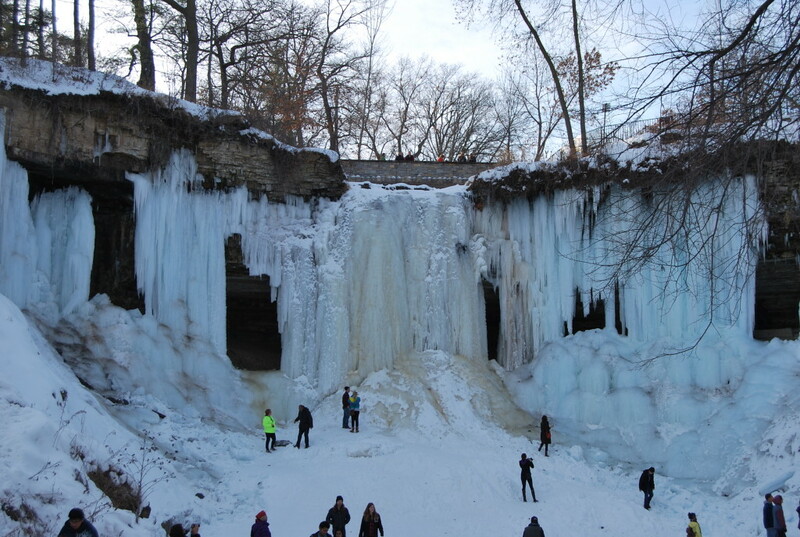 Although HighwayHighlights has covered Minnehaha Falls before, we recently saw it from an angle that not many can say they have. 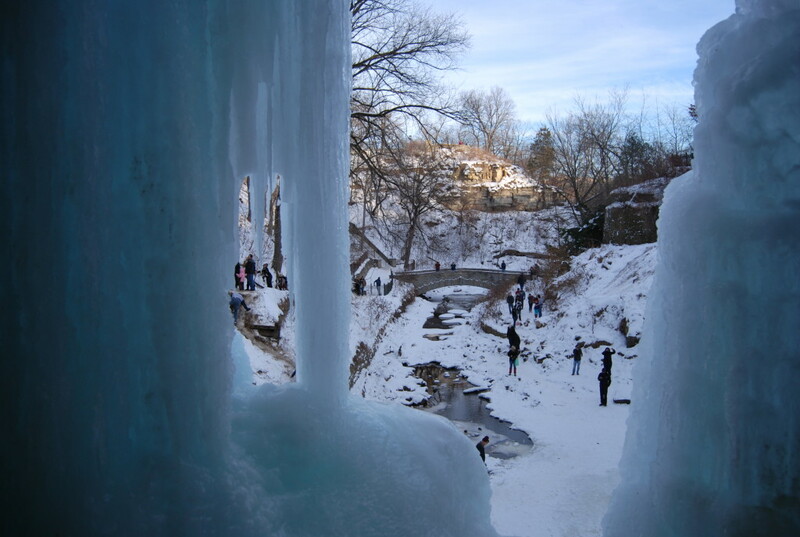 The waterfall, a 53-ft falls formation of Minnehaha Creek found in south Minneapolis, is a popular site for tourists and locals to see some beautiful scenery right in the city. 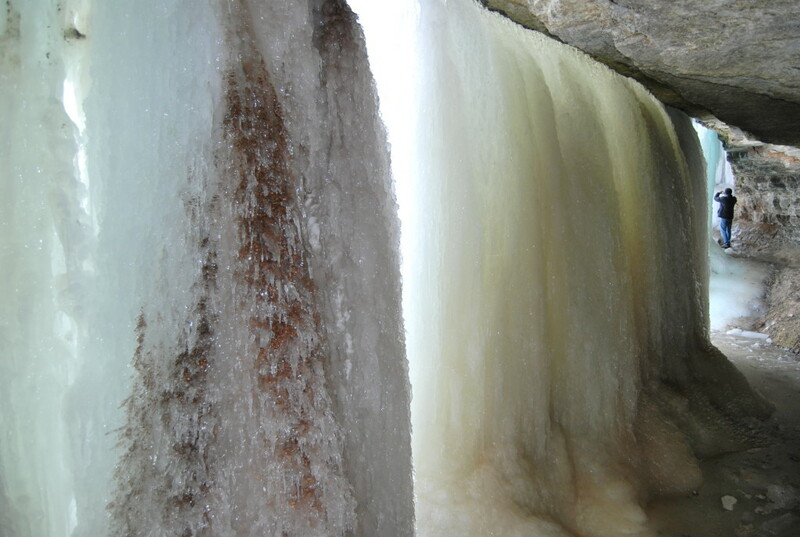 But in winter, the falls freeze up, and adventurous souls can brave the treacherous hike to climb up and around the frozen ice columns, into a cavern behind the waterfall. Those who dare to make the trek are rewarded with something beautiful and amazing. 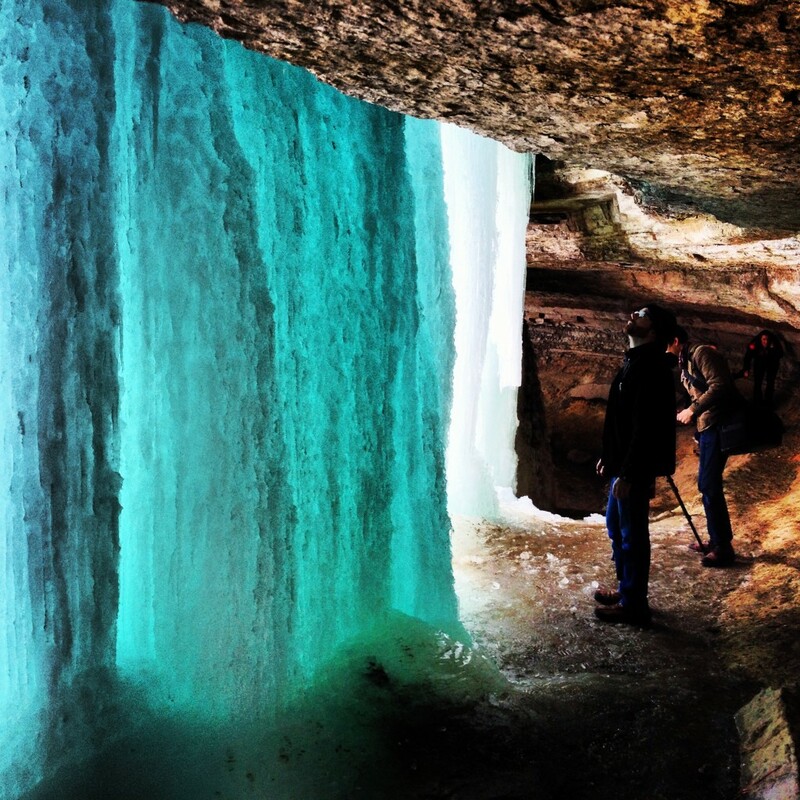 In the afternoon, sunlight reflects off the giant icicles bringing out dazzling emerald and blue colors reminiscent of Superman’s Fortress of Solitude. 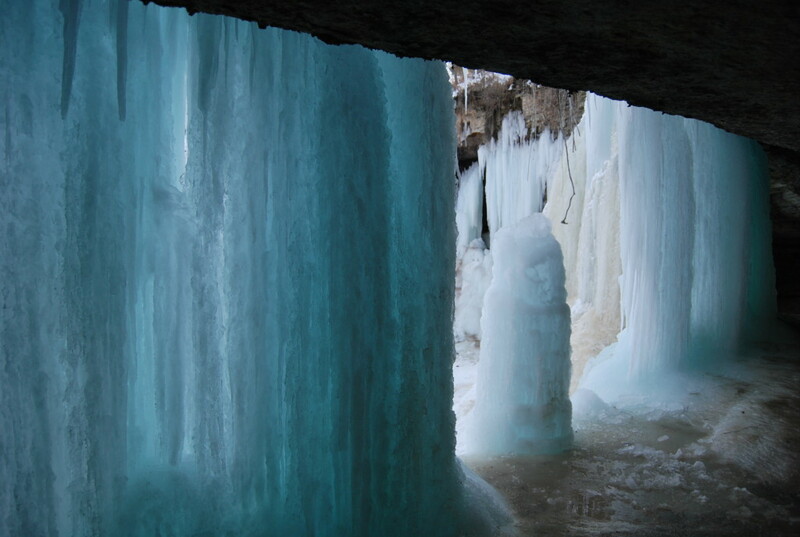 You can sometimes see where ice stalactites and stalagmites have yet to connect into columns, resulting in impressive, massive formations, as pictured below. The day we visited was an unseasonably warm winter day, so naturally the park was full of people. However, this may have made the path behind the falls a bit easier, as the trek up the icy banks of the gorge were much more worn and accessible. Although the steps down to the gorge are technically “closed” in the winter, nobody seems to follow this. I suppose it’s for legal purposes, but thankfully city officials turn a blind eye. Good hiking shoes are definitely recommended, but the climb isn’t terribly difficult. 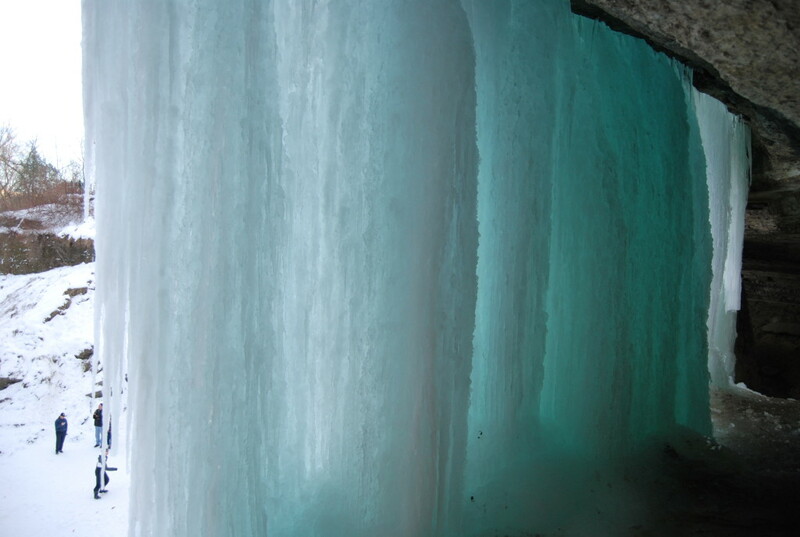 It always surprises me how many people I know in Minneapolis have either never been to Minnehaha Falls, or have been but never in winter. Minneapolis residents are famous for enjoying all four seasons out of doors, and enjoying this winter scene is a great example of this. While in the area: Go check out some of the Twin Cities’ coolest buildings. There are a lot. This is SO cool! 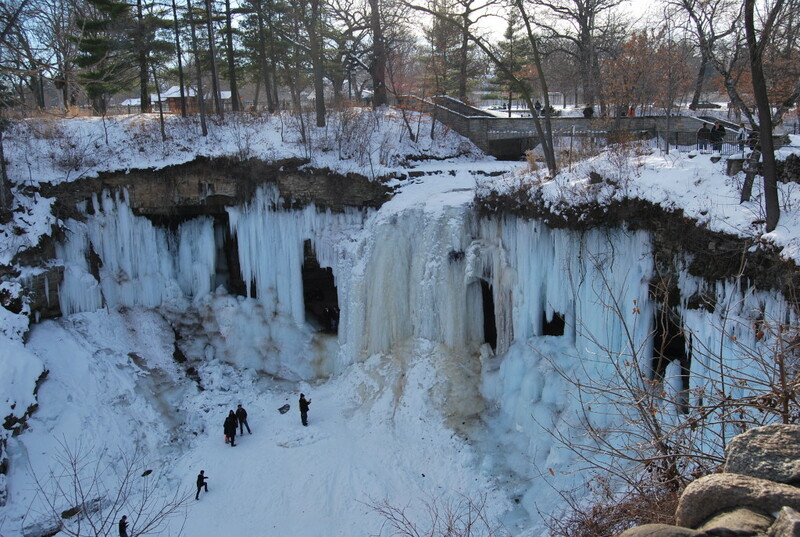 I’m ready to head out to MN right now just to see this – I adore waterfalls. Thanks! It was an amazing sight to see! Yes. That was me. I nearly died. Please stay away from this area. You can view everything just fine from a safe distance.